Power Supply, Adjustable Current and Voltage. Power Supply, Current and Voltage Regulated. Also Adjustable down to Zero Volts! Preliminary Created, "Mar 14 2004"
Damage to Circuit, Especially Experimental Circuits. as a Potentiometer is not very practical for the lower resistance/High Current Ranges. But if you wish to change it to a pot, you can try it. say "10 mA to 500 mA". Than use fixed resistors on the higher current ranges. regulated Supply. And Down to "Zero Volts" out is a Nice Feature. Currents or Higher Voltages, As is Sometimes Needed. and this supply should go down to Zero or very near Zero Volts. an LM350 to give about 3 amps Max. I Haven't tested this, But an LM338 should also work for even Higher Currents. The LM338 is rated at 7 amps peak or 5 amps Continuous. The LM317 has an Maximum Differential In to out voltage of 40 Volts Maximum. of only 35 Volts Maximum. All of these LM317, LM350, LM338 chips in this circuit REQUIRE SUITABLE HEAT SINKS. As they would also in any other high current power supply. 35 volts for the LM317, or30 Volts for the LM350 or LM338. Tapped Transformer, if you only use Half Wave Rectification. But it will suffer in quality. "T1" Should also be "Appropriately Fused". for Filtering losses. If not, it will run excessivey hot under full load conditions. 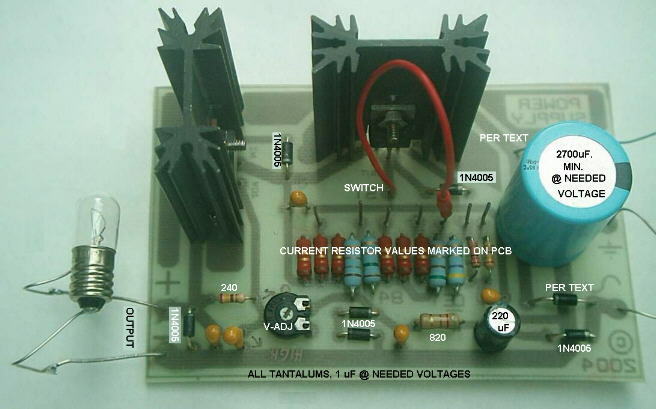 T1 is a Center Tapped transformer, followed by two diodes to give a Full Wave Output. I would recommend building this supply for around 15 to 18 volts out. of the regulators to a more reasonable level. 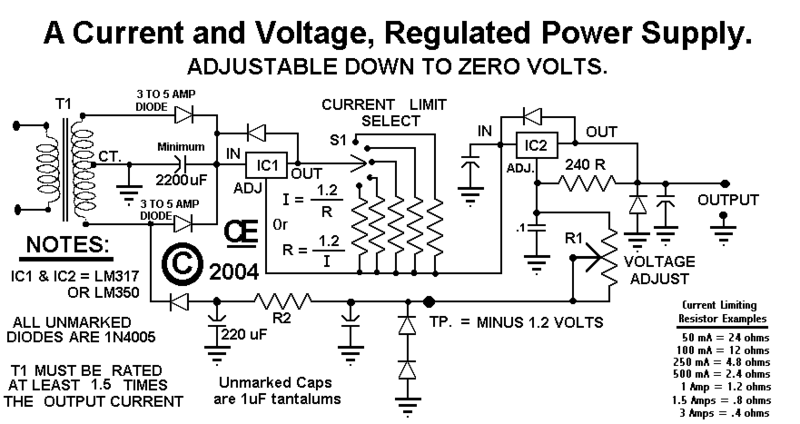 NOTE:  R2 is determined by the voltage across the 220 uF Cap. an approximate 15 mA current flow which will create a quite stable -1.2 volt supply. The PCB is designed for "Moderate Current outputs" with the "On Board Heatsinks". For HIGH CURRENTS, I recommend "Off Board regulators and Large Heat Sinks". with the on board regulators and heat sinks. On the Proto, I used a Mediun sized T0-220 Extruded Aluminum Heat sink. 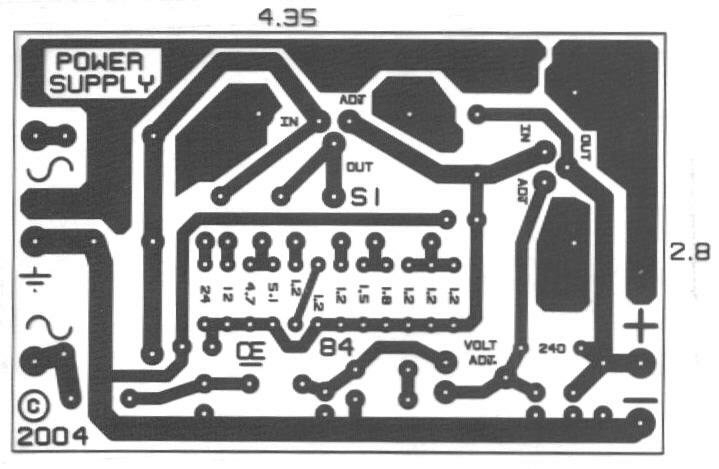 But I also designed the board to allow for a fairly Large one "THM7396". these are Uncommon Values, The PCB shows values to create these fairly close. Use 1/2 watt or better yet, 1 watt resistors. SI mounts Off the Board. and will prevent damage to the PCB if they do become hot. I used 1N4005's for the rectifiers and a 36 volt Center Tapped Transformer. output for a few seconds, without failure. For 3 Amp Diodes, I recommend "1N5400's"
For 6 Amp Diodes, I recommend "Diodes Inc", Part number "6A05DICT"
Both of these diodes are a 50 Volt Ratings and should cost under $1.00 ea..
replaced with good quality .1 uF Caps. This will work Equally well. Prelimimary Assembled Circuit Board, It Works. I am using a Jumper Wire in place of a S1, obviously you will want a switch. Also I only used 1 amp diodes for testing purposes here. Build and Use it at your own risk!